I did just get in on the Star Command Kickstarter, and that actually seems to be built for a very similar itch. Goodness this is a great time for space games. OMG Can we be best friends? I SO missed out on the Star Command kickstarter (by less than an hour). I was going to kick-in at the T-shirt level too, because I <3 that shirt! UPDATE: Whoa - did not see the controversy on their kickstarter until just now. Also, they're kicking PC/Mac ports. Yeah, shame they aren't letting more people in. You'd think they'd want the cashflow, since they only had about 9K backers originally. I think it would be reasonable for it to be a fair bit more expensive than it was for the Kickstarter folks, but shutting non-Kickstarted people out completely seems a bit counterproductive. If they had a paid beta I certainly would have no problems with that. I paid money for them to complete their project how they saw fit, and the more people playing, the better the final product will be. However, it's entirely possible that they have enough feedback already, and managing the influx of responses is taxing for a small studio. It will release in the fall, according to the latest update. I missed it too and also regret missing out on probably the best KS shirt to date*. Also, wait what? There's another one for them? * Seriously. Every time a project has "BACKER" written across the front/back I die a teeny bit inside. The developers have indicated that they intend to do an open beta before the projected August launch. I don't believe the open beta or launch have firm dates yet, however. My impression is that they are getting plenty of feedback at the moment from the current beta participants, more than they can keep up with even. You can see the bug reports/suggestions that have been generated so far here. I forgot to specify that I just got in on the very recent PC/Mac port kickstarter. I missed the original one, but if the price is at all reasonable I will buy the game for Android when it comes out instead of waiting for my PC copy. Is there anywhere to get tooltips for what the different races do after you hire one of them? If you go to the Ship->Crew menu, it should tell you. Didn't you also mention Lissandras on the last page, is that another species or a faction within a species? I think that was their name. There were three people named Lissandra on his ship. Yeah the crew naming system leaves something to be desired at times. Is it just luck whether you get a place to sell and repair? Or is there some way on the map to tell where repair points and stores are? There is a ship module, Long Range Scanners, that you can install that will identify nearby stores. It is installed by default on the stealth ship. 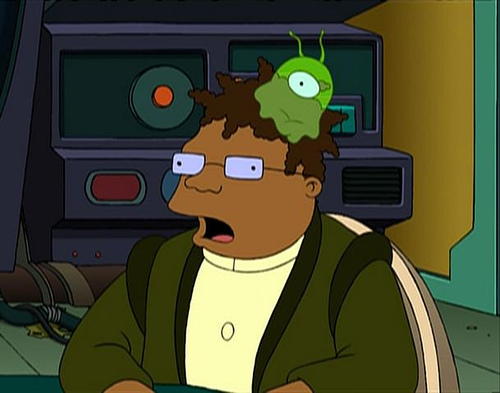 Wait, so... humans are only as good as brain-damaged slugs? Awww... There goes my smile. There was talk on the developer forums about giving humans a boost to training up skills, but I don't believe that has been implemented. It also comes with upgraded doors, no sensors, and an augmentation that automatically repairs hull breaches over time. That aug is pretty useful given you only have 2 crew to work with at the beginning. I assume race specific names are going to be implemented? Ariel and Jack don't really seem like slug people names. But I still want to play this game, and I am jealous of you Kickstarting people. I realize now why I didn't back it -- it had that OnLive demo, and I went 'onlive? yuck!' and closed the tab. I realize now why I didn't back it -- it had that OnLive demo, and I went 'onlive? yuck!' and closed the tab. I'm only now realizing how rare it is for most of the gaming kickstarter projects to actually have a demo/alpha build of some sort available. That seems incredibly important for anyone who's not a known commodity. There was another big patch released yesterday. 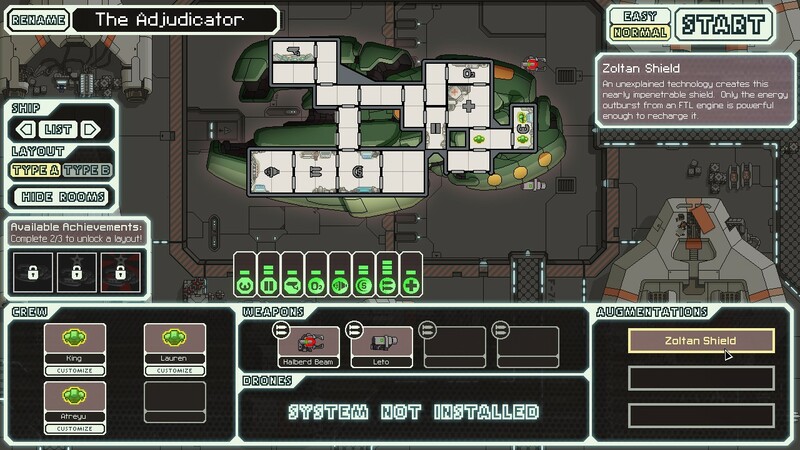 Highlights include a new Zoltan ship and Zoltan sector with new enemies. 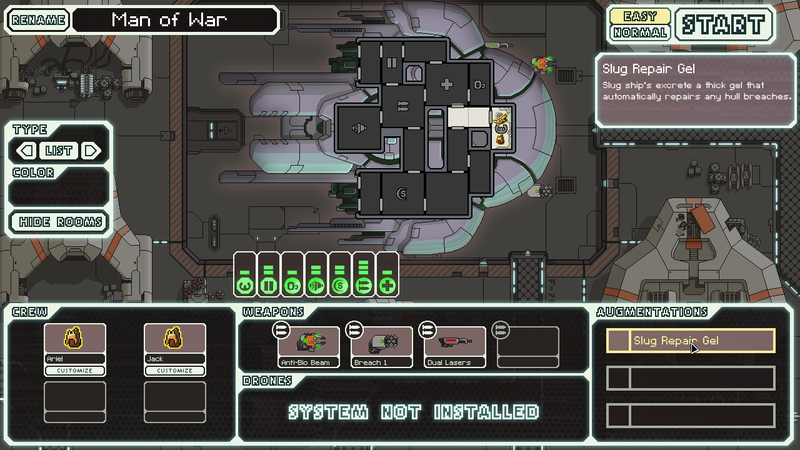 Also now every ship has 2 different room layouts and weapon loadouts. You unlock these new layouts by completing achievements (which are also a new feature of this release). These new layouts essentially give you twice as many ships to play with, so the game feels very fresh again. Is anyone else still playing? Any news on an ETA? Early to mid-September according to the most recent Kickstarter update. 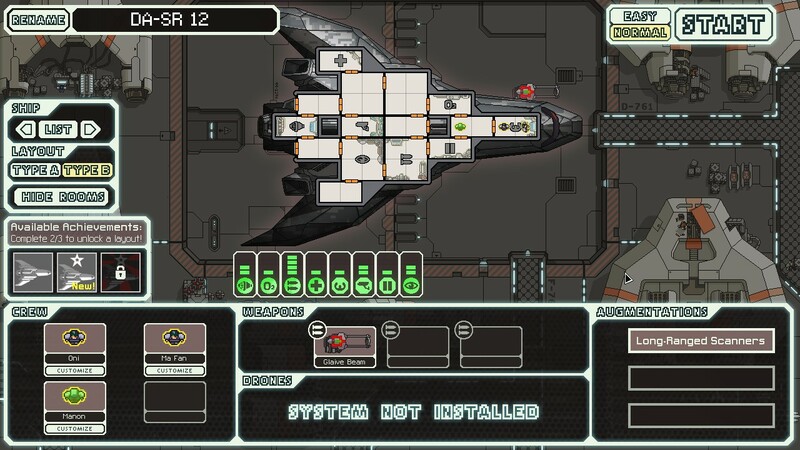 I also unlocked the alternate Stealth ship and the Zoltan ship. Here are the pics. I hope I am not being too spoil-y on this thread. As I barely understand the mechanics of the game, none of that spoils anything really. It's simply very cool to see. Bah, both you and Hedge should be proud as hell for that! It was amazing! Anyone else craving for mantid cakes? Here is an album with most of the new ship layouts. I am still missing the Mantis ship and its alternate layout. I am also missing the Osprey's alternate layout, but I think I have everything else. I included the Osprey in this album because it has a new weapon/system the artillery beam that functions separately from your normal weapons. The Stormwalker is incredibly tough to play. 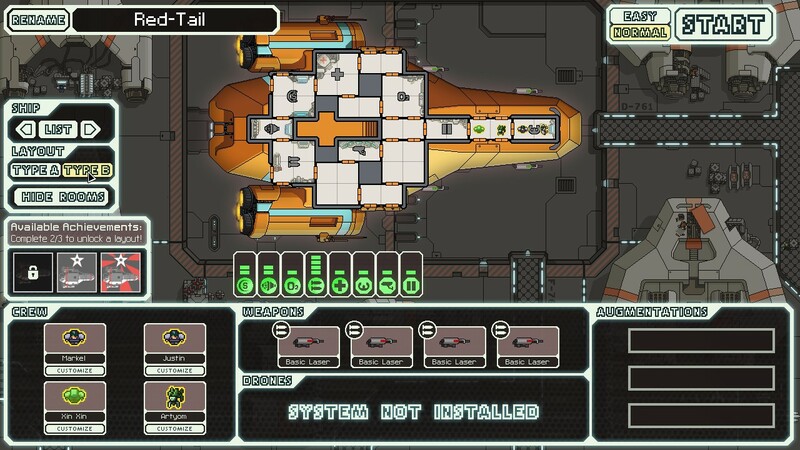 It's only weapons are the Artemis missile and heal bombs, and since it doesn't have a medbay you must rely on heal bombs to heal your crew. I think it is too heavily reliant on missiles, and on my first 2 playthroughs I ran out of missiles by the 2nd sector and was unable to progress. You pretty much need to run away from all automated ships since you will waste too many missiles trying to take them out. Winning with this ship will require finding an early laser weapon like Burst II. The Votex is another really tough layout. I've only played one game with it. My initial strategy was to just keep my single crewman in the cockpit and just vent all the rest of the atmosphere on the ship. This ship really lets you appreciate system repair drones. 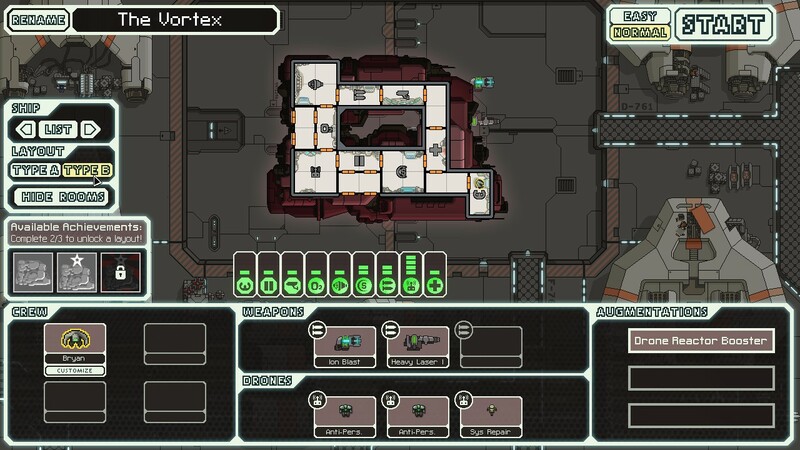 In fact I was taking so much damage that I might have preferred a 2nd repair drone instead of 2 anti-personnel drones. I mainly lost my first run because I was missing too many shots with my ion cannon and heavy laser. It might be nice to have a 3rd, weak weapon to balance this out a bit more. The Noether is a blast to play. It can take out early ships very quickly, which is imperative because it has no shields after its supershield drops. Thankfully the Ion Blast 2 with its 4 second recharge rate can keep enemy shields almost permanently down early on leaving your pike beam to dish out the damage. You need to keep a couple Zoltans in the weapons room early on to power both of the weapons, so I think a lot of the success of this ship is going to rely on finding early crew members to handle maintenance while the Zoltans keep things powered. You also want to move your piloting Zoltan to another room as soon as you get another crewman to make use of his powering ability. Release date is set for September 14th. Also, the game will be released on GOG. Cool.